I was wondering how many bus routes go past their advertised destinations? One example is the 186 to Northwick Park Hospital. You can board the bus at stop HT "Northwick Park Hospital" and still hear the iBus say "186 to Northwick Park Hospital". The bus actually continues past said hospital for 3 extra stops to terminate at "St Mark's Hospital", which is not mentioned on the blinds nor displayed on the iBus system. Theoretically you can board a bus to "Northwick Park Hospital" AT Northwick Park Hospital that doesn't actually GO to Northwick Park Hospital... confusing isn't it! During any relevant Central London demos the 12, 53 and 159 are curtailed to advertise Lambeth North but in practice often terminate one stop further at the Lower Marsh bus stop. The iBus on the 379 says " 379 to Yardley Lane", but the Yardley Lane stop is third last stop on the Sewardstone Road, it then calls at Sewardstone Gardens and finally Yardley Lane Estate stop which is where Boardman Ave and Antlers Hill meet, not Yardley Lane. When I first went there I was surprised that the so called "Yardley Lane" estate consists of three roads, the shortest being Yardley Lane. I wonder if anyone living there regards themselves as resident of Yardley Lane estate. Old blinds would show Waterloo, County Hall and I’d imagine it’s classed as part of Waterloo. The 315’s last stop is Rothschild Street at the bottom of Knights Hill so West Norwood is technically correct - the 2 & 68 are different in that they terminate at the garage so should show Norwood Garage. Some of the VLAs used to show "Norwood Bus Garage". I wonder why they continued using the "West Norwood" blind to be honest. I would say any route where the destination is Vague. It doesn’t state West Norwood Station. It just states 2 to West Norwood. So I wouldn’t say the 2, 68 or 315 meet this Criteria because West Norwood is vague. A Candidate for this is 249 & 432 which actually terminate 1 Stop after Anerley Station. All Routes terminating in Thamesmead once you reach Boilier House you are already in Thamesmead. The 472 most definitely because it goes past tha actual Terminus before going on it loop via Bentham Road & Crossway. If I remember correctly the 68 under Go Ahead used to make a right turn by West Norwood Station to stand on Hannen Road. It was later rerouted to terminate once again by Norwood bus garage. Keeping the blinds showing as 'West Norwood' (instead of West Norwood station or West Norwood Bus Garage) helps keep it somewhat accurate regardless of where it stands. I also imagine it's cheaper for power blind fitted buses in having a standard blind for both the train station and bus garage points. Purley is littered with very vague terminus points, all just labelled as "Purley." The two groups of termini are the 359 and 412 which terminate in the Downlands Precinct, whereas the 127 and 289 terminate up the hill at Purley Station after passing the 359 and 412's terminus point. The worst offender of the four must be the 127 which goes through Purley Library, Purley Cross and Purley High Street/ Purley Station stops before reaching Purley Station. The VLA's did indeed show "Norwood, Bus Garage" with some VLA's showing "Norwood Garage" which, from memory, was the display on L's & DLA's as well. 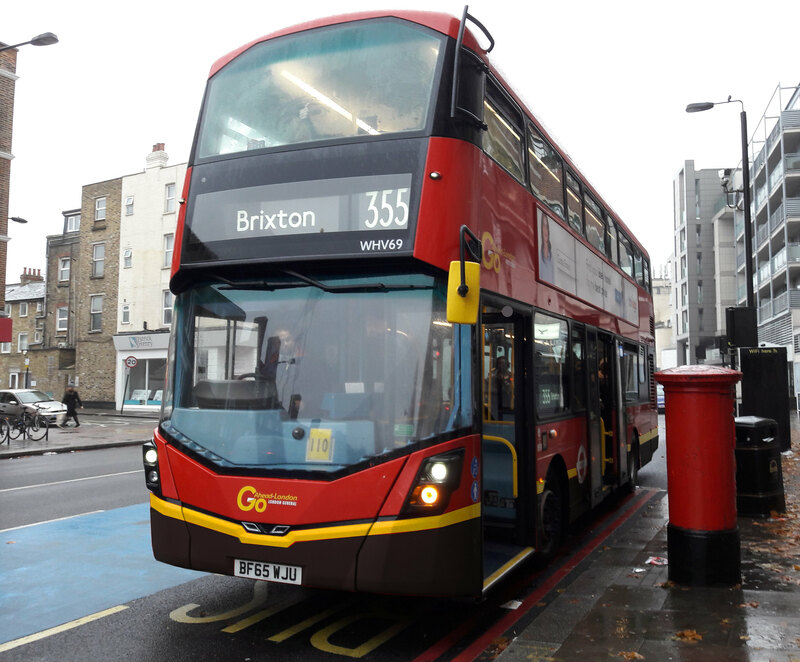 The 315 has shown "West Norwood" as it's blind for many years as from memory, the last stop used to be for the station with buses running out of service to the Cheviot Road stand but then the last stop was first changed to Norwood Garage before then being changed to Rothschild Street. Upon Arriva losing the 68, the last stop was altered to West Norwood Station with buses displaying "West Norwood" and buses turning right into Hannen Road to stand but then after a while, the stand was moved to outside the bus garage's open air parking area on Ernest Avenue where it currently is but with the 68 still alighting at the station. A couple of years ago, they altered it again so the alighting point was at the 68's stand on Ernest Avenue. There has also been a long standing weird quirk in regards to Euston bound 68's and where they stop in the area - whilst the 2 serves the stop outside the garage in both directions and has always done so, the 68 has never served the stop outside the garage towards Euston and only ever served the stop when Arriva & predecessors ran it. Even today, the 68's first stop is at St. Julians Farm Road when it could quite easily serve the garage stop without any issue - this stop was also not served when the 68's current stand first moved to Ernest Avenue but this was later rectified. Not quite the same as the other excellent examples listed here, but Route 493 towards 'Tooting, St George's Hospital' stops outside the hospital before then continuing past it (including past a lengthy bus stand for other routes), going on to serve more stops past Tooting Broadway Station, and then almost completing a full loop to reach its last stop and stand on the hospital grounds. Still, unlike the other examples mentioned, the 493's destination blind is at least accurate for its terminus; despite the fact that it continues to run past its stated destination, it does eventually come back to it! Incidentally, heading back in the other direction, the 493's routing is even more unusual. From its first stop adjacent to the stand, it completes almost two full loops - one serving stops within the hospital grounds; and another around the outside of the hospital and through Tooting - eventually passing the hospital again (!! ), before heading on towards Richmond.